One of the most interesting tastings of the year is when I work through the full lineup of wines from K Vintners and Charles Smith. There are always surprises tucked away, and this year was no exception. Except for a single white wine – a 2011 Viognier – everything I tasted this weekend was red, and from the 2009 vintage. (Although the website is already listing some 2010s for sale, the winery prefers to present the wines with additional bottle age.) It was a warm year in Washington, and in many respects favored the vineyards that Smith likes to draw upon. It marked the last vintage that he was able to obtain grapes from Christophe Baron, which some might view as a stroke of bad luck. But good as those wines are, there are more than a few indications that Smith has already made the necessary adjustments – and improvements – that change often triggers. Among the expansive K Vintners lineup of vineyard-designated Syrahs, there were many familiar faces, a few MIAs, and at least one stunning newcomer. All of these wines are notable for their extraordinary aromatics, their supple and vivid fruit, their incredibly silky, long chain tannins, and the specificity of place (OK – terr-wahr) that each wine expresses. The least expensive ($30) is the Milbrandt and it’s a marvelous wine, bursting with lush fruit pie flavors of blackberry and black cherry. There are grace notes sprinkled generously throughout, hinting at peppery herb and anise. At once smooth and supple, long and generous, this is drinking exceptionally well. The Pheasant ($35) is even better, thick and voluptuous, tasting of black cherry and cassis, with excellent depth and intensity. It’s sleek and supple, yet at the same time deep and polished, with impressive minerality, and a bottom note of granite-like rock. The more expensive Syrahs – Cougar Hills ($45), Morrison Lane ($45), and The Beautiful ($60) all deliver the goods, and even at those prices seem like excellent values when compared with comparably-priced Syrahs from Washington, California, or France. But the big surprise was a new wine, sporting just a giant black K on the label. The “back” label has a graphic of an arrow, pointing to a roughly drawn X – as in X marks the spot. The wine is called The Hidden. It’s from the Northridge vineyard in the Wahluke Slope AVA, and spent 26 months in wood before being bottled. Tremendous depth and complexity is immediately apparent in the nose, and there is no let-down on the palate. It’s a seriously powerful wine, with muscle and magic. It opens generously into beautifully-integrated layers of ripe fruits, confections, candied citrus rind, cacao, and a finishing impression of minerality. Much in the vein of the Royal Slope, it takes Syrah to a level rarely seen anywhere, with a character that can only be found – and not often at that – here in Washington. The winery made 370 cases of The Hidden, and it is priced at $70. This wine, and the wines from the Stoneridge vineyard on the Royal Slope, point to a future for K Vintners and Charles Smith that builds upon, and seems likely to eclipse, past successes. Under the Charles Smith label is another newcomer, a Stoneridge Malbec named Broncho. I can’t say I’ve tasted anything like it before. It’s not just a Washington Malbec, it is a Stoneridge Malbec, with the complex layers of herb and fruit that come from that site. A fascinating nose, threaded with mint, earth, cassis and coffee, leads into a dense and saturated palate – not too big, but complex and complicated, and on into a blood orange finish. It too is priced at $70. The 2009 Charles Smith Royal City Syrah (now up to $140) is once again the top wine of the lineup. 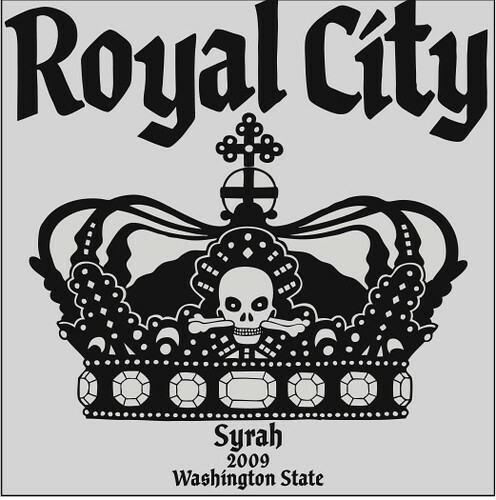 I have rated all previous Royal City Syrahs between 98 – 100 points, and this one fits snugly into that group. In this wine I find the most density, length, detail and sheer expressive flavor. The deep, compact and impossibly complex mix of black fruits, cassis, licorice, coffee, baking spices, smoke, bourbon barrel, and more just keeps rolling on and on through the finish. The Bionic Frog may be its equal, though made in a much different style. The two wines are like goal posts for great Syrah, at opposite ends of the field.